James Robert Dennistoun was born on 7 March 1883 at Peel Forest, Timaru, New Zealand, son of sheep farmer George James Dennistoun and his wife Emily (nee Russell). He was educated at Wanganui Collegiate and Malvern College, Worcestershire, where he gained some military experience as a sergeant in the College's Artillery Corps. Dennistoun spent much of his youth exploring and mountaineering, being the first to climb several peaks of the snow-capped Southern Alps of New Zealand. After briefly serving as a trooper in the South Canterbury Mounted Rifles, in 1910 he joined Captain Scott’s ill-fated Antarctic expedition, for which he was awarded the King’s Antarctic Medal and a Royal Geographical Society medal. Soon after the outbreak of war he worked his passage to England, where he applied for a commission in the North Irish Horse. Lieutenant-Colonel Maude supported his application, although at 32 he considered him “a little over age”. He was commissioned as a 2nd lieutenant on 14 May 1915 and posted to the North Irish Horse, joining F Squadron. On 18 November 1915 he arrived in France with his squadron, on the same day being promoted to the rank of lieutenant. For some months he served as Intelligence Officer to F Squadron's Division – the 33rd. On 16 June 1916 he was attached to the Royal Flying Corps, joining the newly-arrived No.23 Squadron as an observer. The Squadron was then flying 2-seater ‘pusher’ biplanes – FE2bs – from an aerodrome at Izel-le-Hameau, west of Arras. 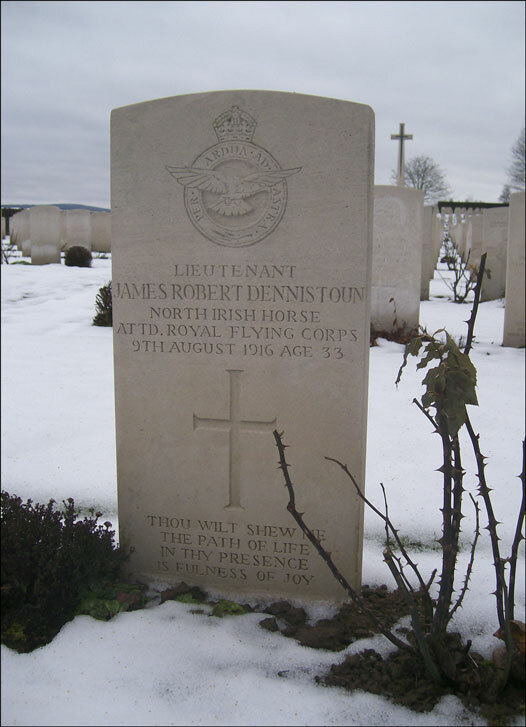 One other at the Squadron was Dennistoun’s cousin, pilot officer Herbert Bainbrigge (Herbie) Russell. Perhaps it was he who persuaded Dennistoun to become a flyer. The two men were permitted to fly together, and ten days after Dennistoun’s posting, took off on a bombing mission east of Arras. The lone aviators took off and dropped their bombs, "surprisingly close to the target" according to Russell. However as they made for home, at 5,000 feet over the town of Biache St Vaast, they were attacked by three Fokker Eindeckers. Dennistoun took three bullets in the stomach and the plane caught fire. Despite being shot through the lung, and suffering severe burns from the flaming aircraft, Russell managed to bring it safely to ground, almost making it across the lines. On 26th June, 1916 J. R. Dennistoun and H. B. Russell were brought down over the German Lines N.E. of Arras while on a bombing expedition. The Machine was on fire and so had to be brought down. J. R. Dennistoun had three shots through his stomach. H. B. Russell was shot through the lung and badly burned. They were taken to a Bavarian Hospital – we think near Douai where they were very kindly treated by Doctors, nurses and orderlies. On 27th June. The nurse Lili Eidam wrote a very kind note to Mrs. Dennistoun. On the 29th June. She again wrote saying they hoped to pull my son through – she also sent an address to write to him – My son also wrote on the 29th June. These letters we received on July 14. We received several other letters – all very cheery and hopeful. The last one July 23 from this hospital he said “they are now lifting me into a chair for an hour every day, but I am glad to get back to bed.” I have little doubt that had they been able to leave him in this hospital he would have pulled through. However on the 3rd August, they sent them off on a 36 hour railway journey the first 19 hours on very rough wooden stretchers, no blankets, and no food, then they were moved into a comfortable bed and train – mattresses and good soup and black bread, then one hour head and tail in a rough furniture van – and then they reached the camp at Ohrdruf in Thuriugia. For 2½ days they never dressed his terrible wounds. Ohrdruf seems to be comfortable, they arrived on the 6th August and my son wrote on that day – full of pluck. On the 9th August that had a third operation – from which he recovered – but at 5 minutes past noon he died peacefully. It is with very great and real sorrow that I have to tell you that dear old Jim had to have a 3rd operation this morning in consequence of a sudden loss of blood and died very peacefully and, I am thankful to be able to tell you in no pain, at 5 minutes past noon today. I, of course did not see him at the last but I saw him 3 hours before and talked to the doctor afterwards. Up till the time when he was taken out of my ward for the operation he was always his usual bright cheery self in spite of the feebleness due to loss of blood. Indeed he has been so all along, always bright and always hopeful even under the worst circumstances, and I know he has on many occasions cheered me up no end when I’ve been very homesick and depressed. The doctor tells me it was quite sudden – he had recovered from the effects of the anaesthetic and he had been talking to the Doctor quite cheerfully as the Doctor told him that he was astonished at him coming round so quickly and the general success of the operation. However at noon he lay back on his pillows to sleep and the Doctor tells me he died at 5 minutes later. As his cousin, I have been given what very few personal belongings he had, such as his cigarette case, and the watch Barbara gave him and which I will endeavour to send you as soon as I have made enquiries as to the means of doing so. The coffin I understand is to be placed in the cemetery here in this village and arrangements are being made so I gather from the Doctor, for its transportation to England. You will of course receive an official letter from this Camp in which they will tell you about the removal to England far more accurately than I can. Of course I feel his loss very very much. He was so nice, and having a relation who knew one’s own family intimately was such a pall. We were always talking about our respective families – about his doings at Peel Forest, of Geordie’s D.S.O. etc. etc. He was at all times so kind and good to me. Words fail me to express my sympathy with you and Uncle George and Barbara in your great loss and really, I cannot attempt it as I can hardly realize it myself yet – but I really and truly am very sorry for you my dear Aunt Emily and please excuse this blundering letter. The Chief Surgeon of the Hospital, several German officers & English soldiers accompanied him to his last resting-place. He was buried with military honours. The protestant pastor of the camp officiated at the burial service. Herbie Russell was repatriated to England in 1918. He later attained the rank of Air Vice-Marshal in the RAF. 'Herbie' Russell, Dennistoun's cousin. The two men were shot down together. First, third, fourth and sixth images sourced from the World War One Canterbury Museum website. Image of gravestone in winter kindly provided by Wolfgang Paland via the Great War Forum. Second gravestone image sourced from the New Zealand War Graves Project. Image of Lieutenant Russell sourced from Air of Authority website.